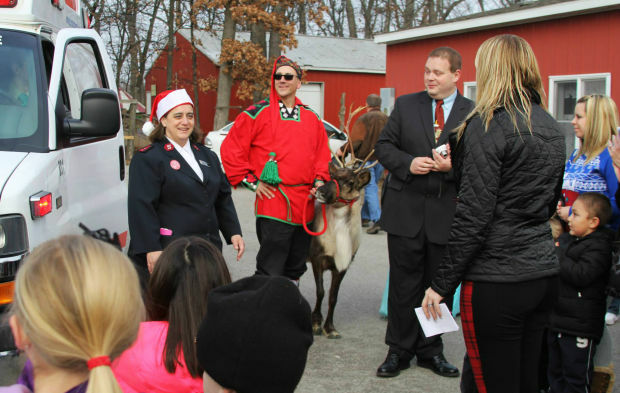 HOBART | County Line Orchard was transformed into a Winter Wonderland over the weekend as hundreds of children participated a breakfast with Santa sponsored by Prompt Ambulance to benefit The Salvation Army. “It was such a nice touch to the holiday,” said Capt. Rebecca Simmons, The Salvation Army’s Lake County coordinator. Unveiled at the event was Prompt’s new ambulance co-branded with The Salvation Army’s logo prominently displayed on each side. Other nonprofits that have benefited from Prompt’s marketing campaigns include the March of Dimes, Lupus, Autism, Honor Flight Chicago and the Porter County Triad. The Breakfast with Santa will bring in more than $2,500 for The Salvation Army, adding to the Red Kettle campaign which stands at $370,000. That’s slightly less than half the goal of $750,000. “No matter how you look at it, it’s a difficult time but we appreciate everybody’s efforts to helping us reach our goal,” Simmons said. The Breakfast with Santa was sponsored by Prompt Ambulance/Taste of Care, which hosted a special pancake competition between Methodist Hospital, Dyer Nursing and Rehab Residences of Deer Creek. Methodist Hospital won the pancake challenge.